Protection wax seal amulet bracelet. 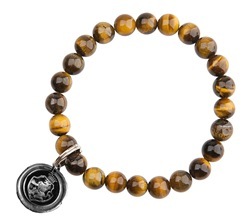 Comes with a Lion wax seal on a Tiger's Eye bracelet. A Lion is the symbol for courage, a Shield is the symbol for protection and a Crown is the symbol for authority and royalty.